This weekend I was determined. I was going to find a proper summer vegetable market if it killed me. 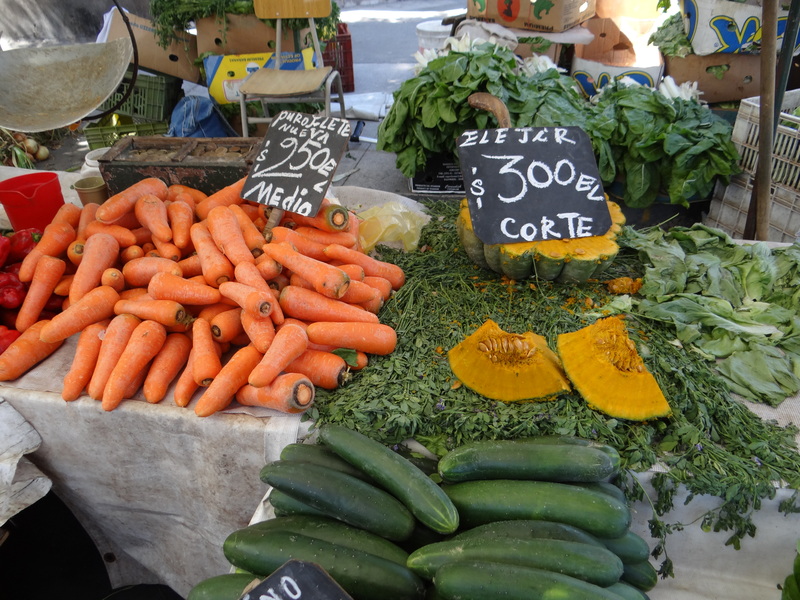 There are many “Ferias Libres” or farmer’s markets in Santiago, in addition to one of the largest vegetable markets ever – La Vega – but they are not easy to navigate and I often bring home mediocre vegetables. I have been asking everyone I meet and combing the internet for recommendations. I finally came across a great post on a blog called FoodyChile that called out a feria libre on Saturdays in Barrio Brasil. Barrio Brasil is often noted as one of the best barrios in Santiago and an area I had wanted to check out for some time now. 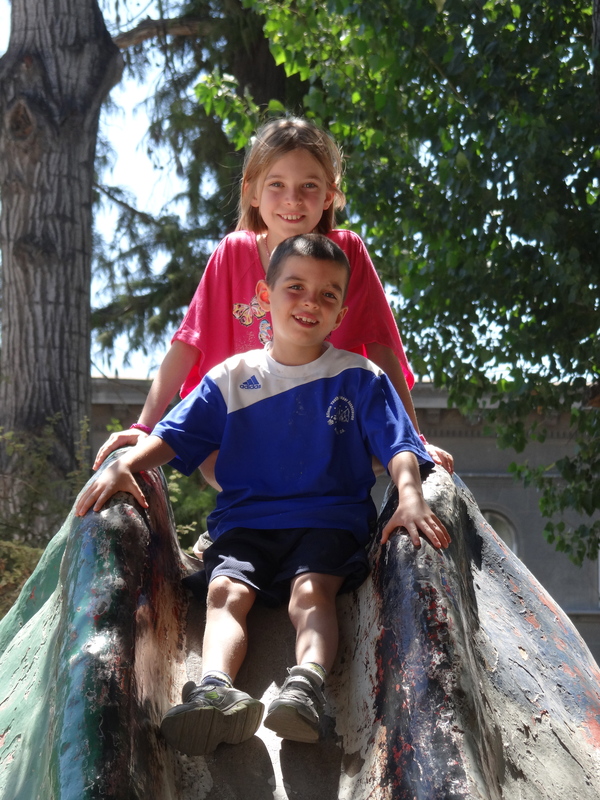 It is in the center of the city which is about a 20 minute drive from La Dehesa, where we live. Turns out the market was well worth the trip. It covered 4-5 blocks on either side of Av. 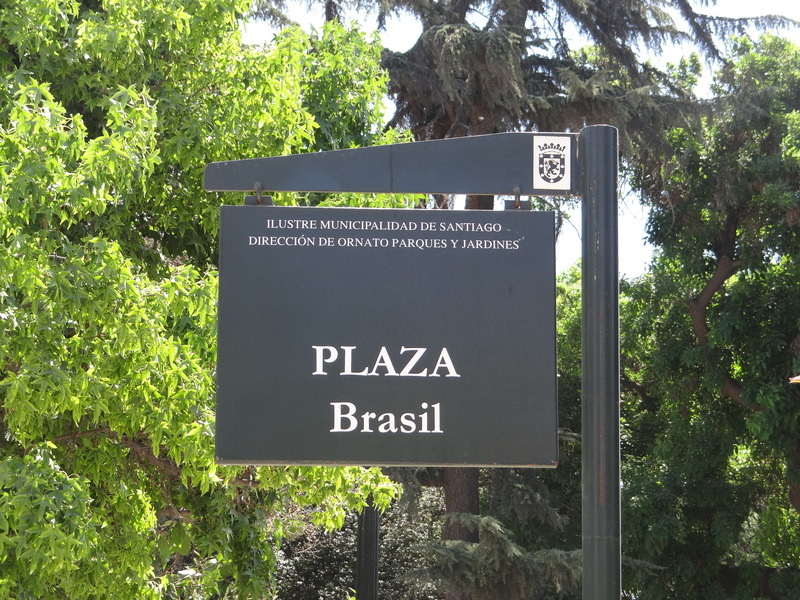 Brasil (On Martinez de Rozas between Ricardo Cummings and Av. Brasil) and each vendor was better than the next. Pumpkin is in nearly every dish in Chile. They are so large that you end up purchasing a big hunk. The peaches are excellent here. They also had two fish purveyors that had nice looking fish. 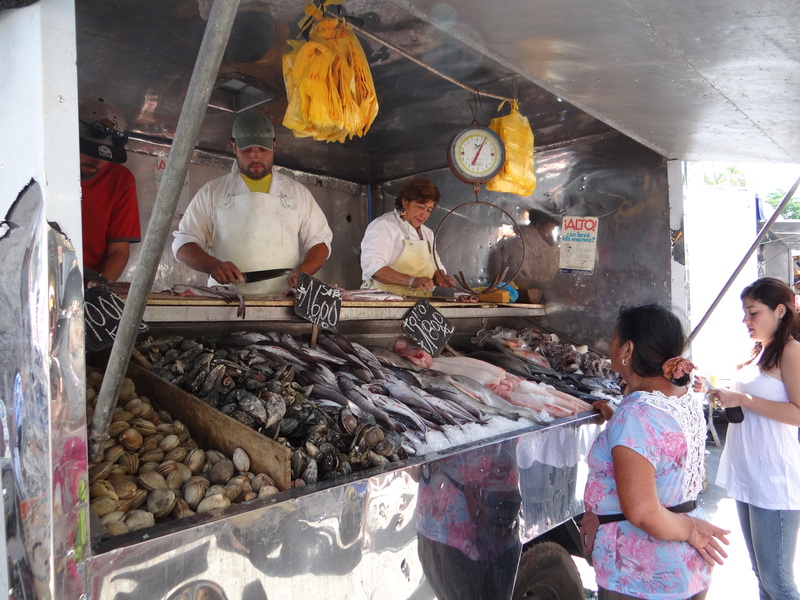 In Chile you purchase the whole fish and they clean and filet it for you. 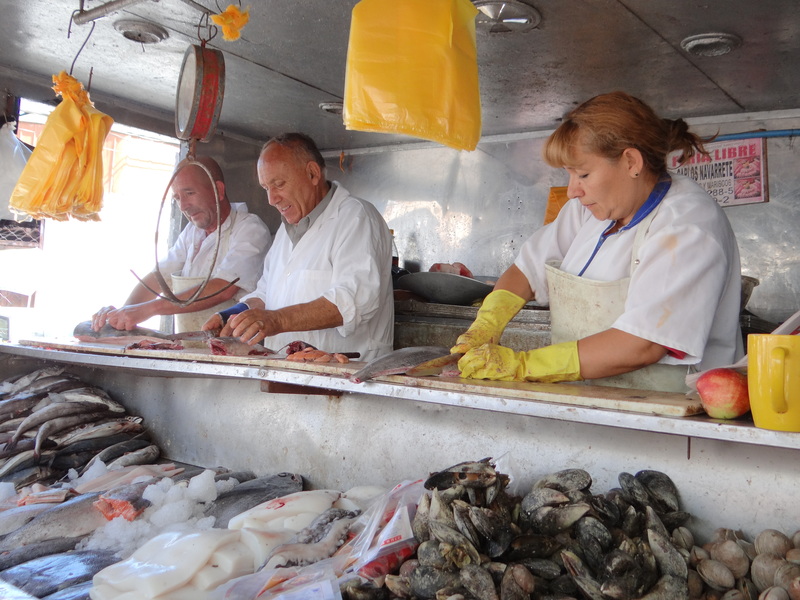 We have had some bad luck with fish so it is really important to be able to see the whole fish before you buy it. 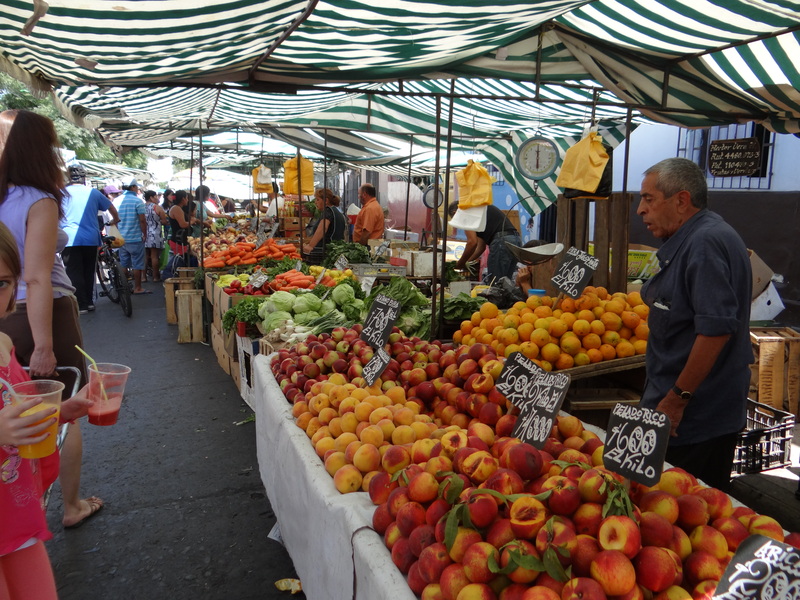 The open-air market conditions are not quite what they would be in the States. We purchased a whole Reineta which is similar to a bream in the United States. John has been trying to master ceviche using the recipe from a famous Peruvian chef named Gaston Acurio, who started the restaurant La Mar (originally in Peru but now has spread to many places including New York and San Francisco), easily our favorite restaurant in Santiago. We hope to perfect it before we return to the states. This time of year, Chileans are very excited about Porotos Granados. They are only available in the summer and they make a lovely stew made with pumpkin and corn. 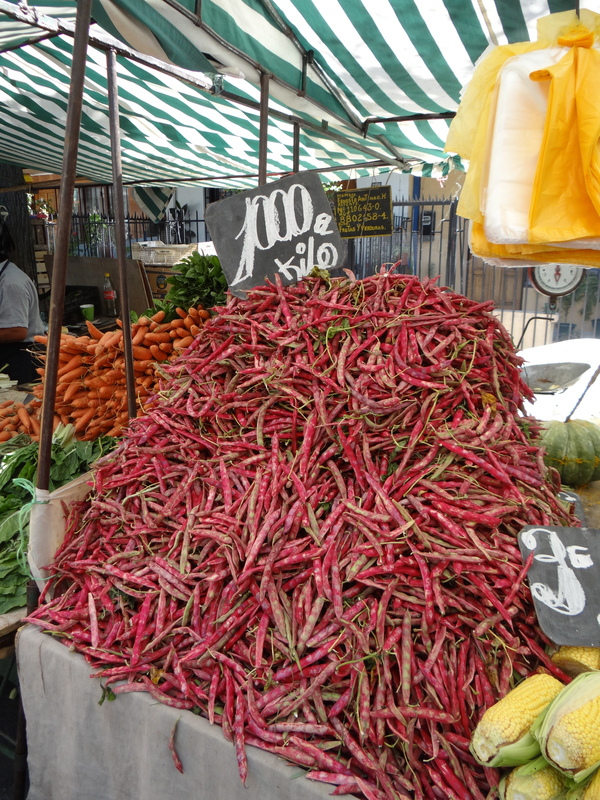 The beans come in a beautiful pink shell and these giant heaps of Porotos Granados are iconic at the summer market. While finding a fresh fruit and vegetable market in a country known for exporting beautiful produce sounds uneventful to someone reading this in the States, as you can tell from my last post, it is indeed noteworthy. I have not cracked the code on food in this country. I try, and try again, and try again, but often things end poorly. So finding this feria made my weekend. We also found the great park in Plaza Brasil where the kids could play and a fairly good Italian restaurant, Sole Mio, for lunch. I will continue my food quest. I reached out to a few food bloggers in Chile to see if any might be interested in organizing a market tour for expats. Colin Bennett from FoodyChile.com has been terrific. He is going to take a group of us out to the markets this coming weekend. I’m excited to finally know how best to manage these sprawling markets and find the best produce before summer runs out. Wish me luck! This entry was posted in Barrio Brasil, Chilean Food, Ferias Libres and tagged Barrio Brasil, Food in Santiago by kierstenmurnane. Bookmark the permalink. Keep it up. Found a recipe for those beans in smitten kitchen but very different than Cecelia made us.